The Seger method of rationalizing the chemistry of glazes does not work as well at lower temperatures because some oxides that are powerful fluxes at high temperatures are refractory in low fire. Oxides have a much more individual presence (at each temperature range) than the Seger method tends to recognize. Also, their contributions to particular properties often are not linear according to concentration. For example, boron is both a glass and a flux and the logic for its employment at various temperature ranges differs. It does not 'plug into' a Seger formula well. Many people prefer to use Mole% when rationalizing how a formula relates to the fired product. However, all of this being said, there is great value in a method of presentation that clearly shows the relationship between Al2O3, SiO2 and everything else. Some argue that the unity formula method of presenting glazes is not precise enough for glaze chemistry calculations. However, the greatest source of imprecision by far is the accuracy of the analyses of the materials being used. Any method that calculates an exact match for an existing chemistry will also produce an exact match in unity formulas. 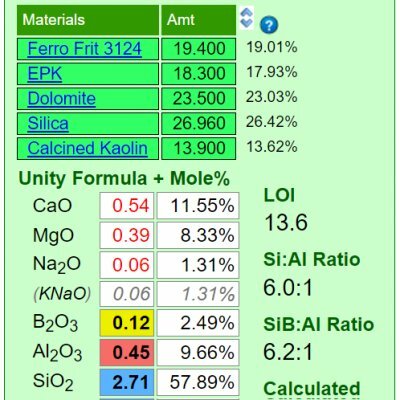 Unity formulas work better in targeting when doing batch to chemistry calculations because additions or changes in percentage of a material do not always change every number in the formula. However it must be remembered that glaze chemistry is not about precise mathematics, it is comparative and best viewed in context and as a tool to help when comparing one thing with another. Digitalfire desktop Insight required that users specify whether to unify recipes to RO or R2O3. However Insight-live automatically sets this (the group having the greater total wins the unity setting). Users can click the 'Auto Unity' heading and it will cycle between various settings, eventually coming back to auto-unity. Recipes remember their settings.